Tokyo has lodged a protest with the Chinese Foreign Ministry for barring a reporter with the conservative Sankei Shimbun daily from participating in pool coverage of a high-ranking bilateral meeting in Beijing, Chief Cabinet Secretary Yoshihide Suga said Thursday. The Chinese Foreign Ministry’s exclusion of the reporter from the Sankei, which is often critical of China, is “extremely regrettable,” and runs counter to Tokyo’s stance that “basic human rights, including freedom of expression, and the rule of law are universal values shared by the international community,” Suga said. “Those values must be guaranteed in any country,” he added. 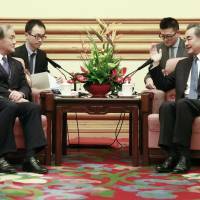 Vice Foreign Minister Takeo Akiba and Yutaka Yokoi, the Japanese ambassador to China, each made a protest to the Chinese Foreign Ministry on Wednesday, the top government spokesman said. The incident involved a media pool tasked with covering the talks on Wednesday between Akiba and Chinese Foreign Minister Wang Yi. A day before the meeting, the Chinese Foreign Ministry notified the Japanese Embassy that it cannot grant the Sankei, whose reporter had been chosen as a member of the pool, access to the meeting “in accordance with the ministry’s policy,” the Sankei said in an article published Wednesday. Further negotiations between the ministry and the embassy went nowhere, with Beijing adamantly rejecting a reversal of course on its decision, the paper said. Beijing’s attitude eventually led all Japanese participants of the pool, including those with TV broadcasters, to inform the embassy that they will have to boycott coverage of the meeting, according to reports. Behind the move was a common understanding among Japanese media that “it is intolerable to single out a specific media outlet and deprive it of a reporting opportunity,” the Sankei said. The latest incident is not the first time the conservative daily has clashed with Beijing. In June, Chinese authorities similarly discriminated against the Sankei when it decided not to issue a visa for a reporter who was requesting permission to visit Tibet as a member of a press delegation organized by the Japan National Press Club. After the meeting on Wednesday, Akiba said he has made arrangements for Prime Minister Shinzo Abe’s possible visit to China in October, when the two nations will celebrate the 40th anniversary of the enactment of a bilateral peace and friendship treaty. 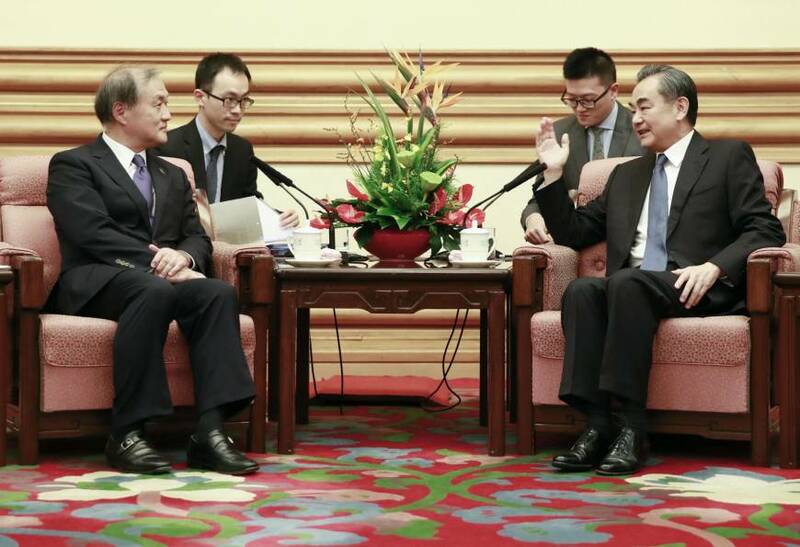 “I cannot mention the specific timing at this juncture, but we are arranging it in an active manner,” Akiba told reporters after he met with Wang and Vice Foreign Minister Le Yucheng in Beijing, according to Kyodo News. If the trip is realized, it would be the first visit by a Japanese prime minister to China since December 2011, apart from trips to attend international conferences.